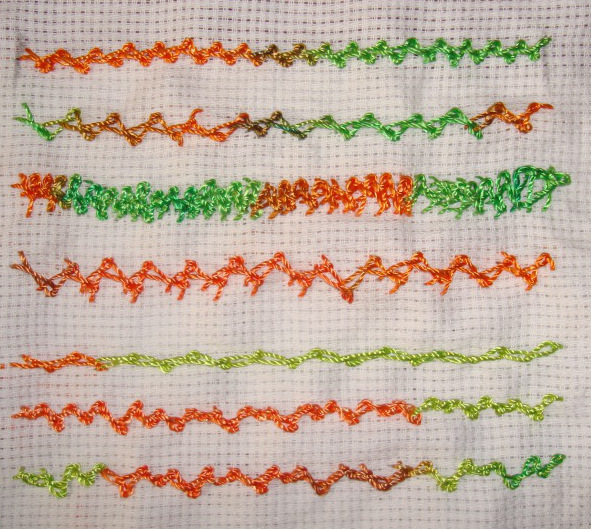 The sampler was completed after working some stitch combinations. Working this stitch in a straight line is skill I am yet to acquire! 7.The Spanish feather stitch rows are combined with detached chain stitches and whipped and laced running stitches. 8.zigzag chain stitch, slipped detached chain stitches ,french knots and fly stitch variations are worked with spanish feather stitch in this part of the sampler. 1.After working the Spanish feather stitch as per guidance in the first row, the wide and narrow versions are worked in the next two rows. 2.the first row is a an unsuccessful attempt to work this stitch tall and wide, it looks like spaghetti. The short and narrow version in the second row is better. The third sample is the long and short Spanish feather stitch.